DC Entertainment, home of the World’s Greatest Super Heroes and the comic book industry’s most talented artists and writers, today announced a stellar program of New York Comic Con panels, signings, announcements and other events certain to excite fans of all ages, led by a jaw-dropping display of eight historic Superman costumes from the big and small screen in celebration of Superman’s 75th Anniversary. With an array of costumes previously worn by the likes of Christopher Reeve, Henry Cavill, Brandon Routh, Dean Cain and Tom Welling – the scope of this epic exhibit will expand the publisher’s convention presence beyond the floor of the Jacob Javitz Center and into the building’s public entryway – making DC’s expanded footprint undeniable to convention attendees and the public at large, and making for a convention-wide 75th anniversary celebration of The Man of Steel. A star-studded panel honoring the Man of Steel and discussing the beloved character’s many personifications, impressive history, and ongoing relevance within society and entertainment, is also in the works. DC Entertainment will further put its stamp on this year’s convention through appearances by some of the biggest creative names in the comic book industry – including the writers and artists from Batman, Green Lantern and Superman family of titles, MAD Magazine and many more. Legendary author Neil Gaiman’s acclaimed SANDMAN series will also be a highlight as fans clamor for the first issue of THE SANDMAN: OVERTURE, a centerpiece of the ongoing reinvigoration of the Vertigo imprint. Additionally, for the first time DC will host over 50 creator signings at an exclusive DC Entertainment area in the increasingly popular Artist Alley. The largest English-language publisher in the world will continue to make its mark with a packed schedule of panels, and fantastic collection of additional appearances and signings, exclusive announcements and other events. · As their epic BATMAN: ZERO YEAR storyline expands into the rest of DC Comics – The New 52 and BATMAN VOL. 3: DEATH OF THE FAMILY prepares for its October release, superstar creators Scott Snyder and Greg Capullo will share the latest insider’s view on The Caped Crusader and their unique creative process. A Batman panel featuring this “dynamic duo” and creators such as John Layman, Ann Nocenti, Peter Tomasi and James Tynion IV will be a convention highlight. Following this year’s show, Snyder and Capullo will be the guests-of-honor at a Q&A and signing for BATMAN VOL. 3: DEATH OF THE FAMILY on Monday, October 14th at 7:00 p.m. the Union Square Barnes & Noble in NYC. · Set for release on October 30, Vertigo’s THE SANDMAN: OVERTURE will also be a convention highlight as Neil Gaiman returns to the iconic comic book series that launched his career. Vertigo will be celebrating its 20th year in publishing through panels, signings and more, casting a spotlight on the imprint’s horror, mythic fiction, and sci-fi titles – including the dark fantasy COFFIN HILL, the epic adventure HINTERKIND, and THE SANDMAN spin-off THE DEAD BOY DETECTIVES as well as the new series THE WAKE, TRILLIUM, FBP: FEDERAL BUREAU OF PHYSICS and more. · Kicking off on October 2 and spanning across all GREEN LANTERN family titles throughout the month, the “Lights Out” crossover event will change the Green Lantern universe forever! Convention attendees will collect more behind-the-scenes knowledge on this ambitious storyline by attending the October 13 panel featuring creators Bernard Chang, Van Jensen, Justin Jordan, Charles Soule, Brad Walker, Robert Venditti and more. The storyline ties together every Lantern of every Corps who has ever appeared in any comic book – ever. Nothing is held back, and devoted fans will want to know more! 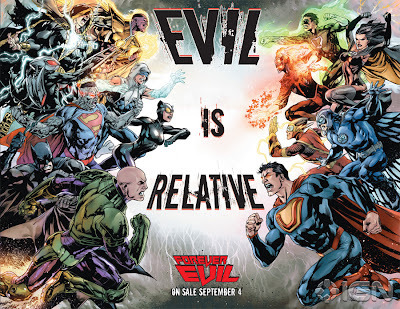 · Fresh off the release of FOREVER EVIL #1, written by comic legend Geoff Johns with artwork by the infinitely talented David Finch, as well as the unprecedented “Villains Month” unveiling of 52 villain-centric 3-D Motion covers from across The New 52, fans will get the chance to learn more about the FOREVER EVIL storyline (and all of the dastardly villains that everyone loves to hate) at the Justice League – Forever Evil panel on Saturday, October 12. Boasting a collection of DC creators that includes Finch, Ray Fawkes, Matt Kindt, Joe Prado, Ivan Reis and more. 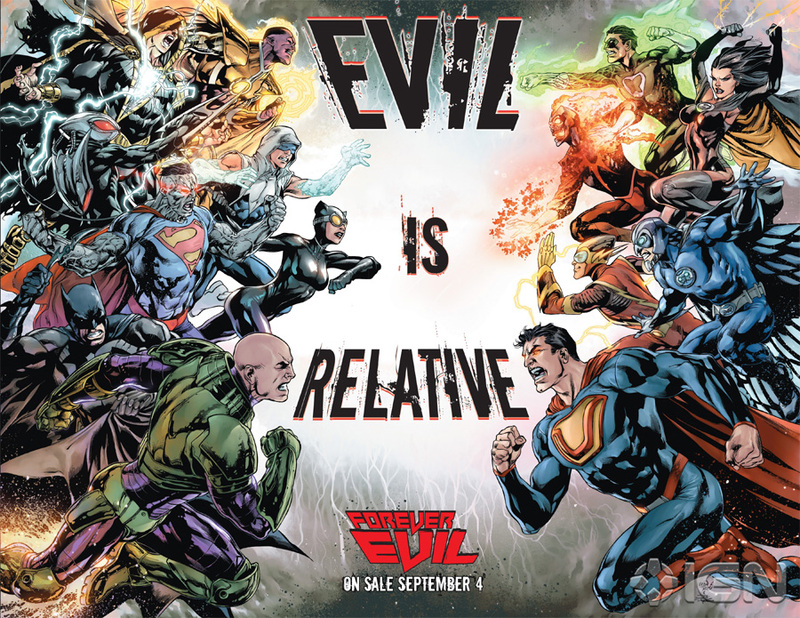 Convention attendees will also get a sneak preview of the all-new documentary “Necessary Evil: Super-Villains of DC Comics,” which investigates the inner-workings of the most nefarious collection of baddies in comics history. Narrated by legendary film bad guy Christopher Lee, “Necessary Evil: Super-Villains of DC Comics” will be released by Warner Bros. Home Entertainment on October 25. · Get an inside look at INSIDE MAD, the hugely anticipated collection being released on October 29 from “The Usual Gang of Idiots” at MAD Magazine. Those looking to get an additional dose of the iconic magazine’s acclaimed wit and snark can visit the Mad About MAD panel on October 12 – led by Editor John Ficarra and a laughter-inducing cast of characters. · A wide variety of exclusive offerings will be available throughout the weekend at this year’s New York Comic Con – including giveaways throughout the weekend as well as FOREVER EVIL #1, BATMAN #24 and SUPERMAN/WONDER WOMAN #1 variant covers priced at $10 each. DC Collectibles also has two exciting convention exclusives lined up for New York, including a DC Nation: Super Best Friends Forever Poison Ivy statue and DC Super Heroes of Green Lantern 3.75” action figure two-pack featuring Hal Jordan and Blue Lantern Saint Walker. Each of these exclusive offerings will be available for sale at the DC Collectibles Boutique at the Graphitti Designs booth (#755). · Fans can get all the latest information on New York Comic Con and other DC Entertainment events by downloading the free DCE Events app for iOS and Android smartphone users. It’s available for download today on Apple’s App Store and the Google Play Store.